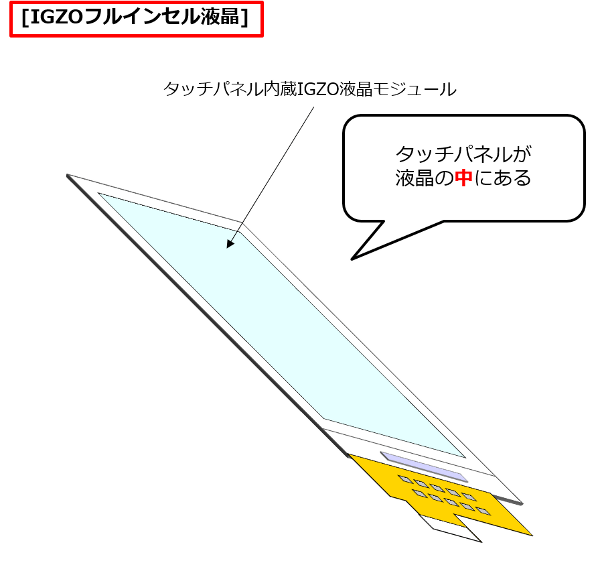 Two of Sharp's most recent smartphones, the Aquos Ever SH-02J by Docomo, and the Aquos U SHV 37 by AU feature the next generation IGZO display where the touch panel module (the digitizer) has been integrated into the liquid crystal display, the so called in-cell touch type display. The typical LCD structure comprises three layers: the top protective layer which is made of hardened glass, e.g. Gorilla Glass, the touch panel (digitizer), and the display itself. This not only makes the phone's display thicker (albeit by a milimeter or so), but also obstructs backlight. By integrating the digitizer into the LCD, the same amount of energy spent on the backlight now produces greater brightness as the light now needs to only penetrate two layers instead of three. This also reduces light reflected from the outside, thus improving visibility. Add the IGZO technology in the display equation reckoning and a further improvement is accomplished. The IGZO display type uses much less energy because of the so called idling stop functionality: when the display is showing a static image or an image that does not require refreshing at the standard 60 Hz rate, the display controller decreases the refresh rate, thus saving energy. This is why Sharp smartphones are typically able to last 3 or more days on a single charge – a feat no other brand can dream of. Since the new in-cell touch type IGZO no longer requires two separate controllers (IC chips) – one for the LCD and one for the digitizer, this leads to even greater energy savings because the digitizer is now refreshed at the same rate as the display. Using a part of the energy savings, Sharp have increased the voltage of the touch panel, which in turn improves resistance to water – and drops of water are no longer erroneously detected as touch events, thereby improving touch operation (the latest of Sharp smartphones can even be operated using gloves). Oh, and it makes the phone a bit lighter. Sharp began mass-producing in-cell touch type displays back in June 2015 but only for their conventional CG-silicon LCDs. Financial struggles did indeed significantly delay implementation of this technology into their IGZO displays.